Everything you need to get started! This needle head moxa is the same as the MX10b. The only difference is that this pack comes with 120 cones, 6 baskets and a split spoon for easy removal of the used moxa cones from the needle head. Smokeless and odourless charcoal-based moxa cones for hot needling. Must be used with the reusable wire baskets. 6 baskets are included with this pack and may also be purchased separately. 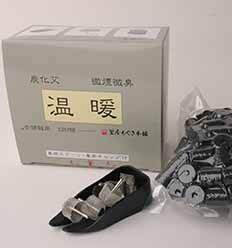 Only suitable for use with Japanese style acupuncture needles with a solid base (and no loop) such as AcuGlide and Acumaster.